In meditating for many years on what might be implied in "the image of the beast," I could never find the least satisfaction in all the theories that had ever been propounded, till I fell in with an unpretending but valuable work, which I have noticed already, entitled An Original Interpretation of the Apocalypse. That work, evidently the production of a penetrating mind deeply read in the history of the Papacy, furnished at once the solution of the difficulty. There the image of the beast is pronounced to be the Virgin Mother, or the Madonna. This at first sight may appear a very unlikely solution; but when it is brought into comparison with the religious history of Chaldea, the unlikelihood entirely disappears. In the old Babylonian Paganism, there was an image of the Beast from the sea; and when it is known what that image was, the question will, I think, be fairly decided. * EUSEBIUS, Proeparatio Evangelii. This statement is remarkable, as showing that the horns which the great goddess wore were really intended to exhibit her as the express image of Ninus, or "the Son." Had she worn merely the cow's horns, it might have been supposed that these horns were intended only to identify her with the moon. But the bull's horns show that the intention was to represent her as equal in her sovereignty with Nimrod, or Kronos, the "Horned one." * TOOKE'S Pantheon. That the key of Cybele, in the esoteric story, had a corresponding meaning to that of Janus, will appear from the character above assigned to her as the Mediatrix. He, as the cleanser from sin, was called the "Unpolluted god"; she, too, had the power to wash away sin, and, though the mother of the seed, was called the "Virgin, pure and undefiled." He was represented as "Judge of the dead"; she was represented as standing by his side, at the judgment-seat, in the unseen world. He, after being killed by the sword, was fabled to have risen again, and ascended up to heaven. She, too, though history makes her to have been killed with the sword by one of her own sons, * was nevertheless in the myth, said to have been carried by her son bodily to heaven, and to have been made Pambasileia, "Queen of the universe." Finally, to clench the whole, the name by which she was now known was Semele, which, in the Babylonian language, signifies "THE IMAGE." ** Thus, in every respect, to the very least jot and tittle, she became the express image of the Babylonian "beast that had the wound by a sword, and did live." ** Apollodorus states that Bacchus, on carrying his mother to heaven, called her Thuone, which was just the feminine of his own name, Thuoenus--in Latin Thyoneus. (OVID, Metam.) Thuoneus is evidently from the passive participle of Thn, "to lament," a synonym for "Bacchus," "The lamented god." Thuone, in like manner, is "The lamented goddess." The Roman Juno was evidently known in this very character of the "Image"; for there was a temple erected to her in Rome, on the Capitoline hill, under the name of "Juno Moneta." Moneta is the emphatic form of one of the Chaldee words for an "image"; and that this was the real meaning of the name, will appear from the fact that the Mint was contained in the precincts of that temple. (See SMITH'S "Juno") What is the use of a mint but just to stamp "images"? Hence the connection between Juno and the Mint. * The very way in which the Popish Madonna is represented is plainly copied from the idolatrous representations of the Pagan goddess. The great god used to be represented as sitting or standing in the cup of a Lotus-flower. In India, the very same mode of representation is common; Brahma being often seen seated on a Lotus-flower, said to have sprung from the navel of Vishnu. 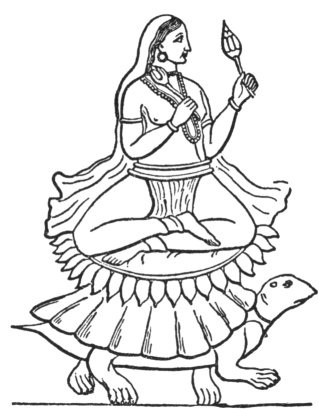 The great goddess, in like manner, must have a similar couch; and, therefore, in India, we find Lakshmi, the "Mother of the Universe," sitting on a Lotus, borne by a tortoise (see figure 57). 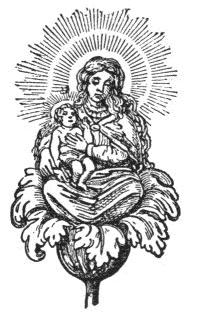 Now, in this very thing, also Popery has copied from its Pagan model; for, in the Pancarpium Marianum the Virgin and child are represented sitting in the cup of a tulip (see figure 58). There is not one line or one letter in all the Bible to countenance the idea that Mary should be worshipped, that she is the "refuge of sinners," that she was "immaculate," that she made atonement for sin when standing by the cross, and when, according to Simeon, "a sword pierced through her own soul also"; or that, after her death, she was raised from the dead and carried in glory to heaven. But in the Babylonian system all this was found; and all this is now incorporated in the system of Rome. Further, we read in the Pope's decree of the Immaculate Conception, that that same Madonna, for this purpose "wounded with the sword," rose from the dead, and being assumed up on high, became Queen of Heaven. If all this be so, who can fail to see that in that apostate community is to be found what precisely answers to the making and setting up in the heart of Christendom, of an "Image to the beast that had the wound by a sword and did live"? * Memoir of Rev. Godfrey Massy. In the Paradisus sponsi et sponsoe, by the author of Pancarpium Marianum, the following words, addressed to the Virgin, occur in illustration of a plate representing the crucifixion, and Mary, at the foot of the Cross, with the sword in her breast, "Thy beloved son did sacrifice his flesh; thou thy soul--yea, both body and soul." This does much more than put the sacrifice of the Virgin on a level with that of the Lord Jesus, it makes it greater far. This, in 1617, was the creed only of Jesuitism; now there is reason to believe it to be the general creed of the Papacy. If the inspired terms be consulted, it will be seen that this was to be done by some public general act of apostate Christendom; (verse 14), "Saying to them that dwell on the earth, that they should make an image to the beast"; and they made it. Now, here is the important fact to be observed, that this never was done, and this never could have been done, till eight years ago; for this plain reason, that till then the Madonna of Rome was never recognized as combining all the characters that belonged to the Babylonian "IMAGE of the beast." Till then it was not admitted even in Rome, though this evil leaven had been long working, and that strongly, that Mary was truly immaculate, and consequently she could not be the perfect counterpart of the Babylonian Image. What, however, had never been done before, was done in December, 1854. Then bishops from all parts of Christendom, and representatives from the ends of the earth, met in Rome; and with only four dissentient voices, it was decreed that Mary, the mother of God, who died, rose from the dead, and ascended into heaven, should henceforth be worshipped as the Immaculate Virgin, "conceived and born without sin." This was the formal setting up of the Image of the beast, and that by the general consent of "the men that dwell upon the earth." "no man might buy or sell, save he that had the mark, or the name of the beast, or the number of his name." No sooner is the image set up than we see this very thing begun to be carried out. What was the Concordat in Austria, that so speedily followed, but this very thing? That concordat, through the force of unexpected events that have arisen, has not yet been carried into effect; but if it were, the results would just be what is predicted--that no man in the Austrian dominions should "buy or sell" without the mark in some shape or other. And the very fact of such an intolerant concordat coming so speedily on the back of the Decree of the Immaculate Conception, shows what is the natural fruit of that decree. The events that soon thereafter took place in Spain showed the powerful working of the same persecuting spirit there also. During the last few years, the tide of spiritual despotism might have seemed to be effectually arrested; and many, no doubt, have indulged the persuasion that, crippled as the temporal sovereignty of the Papacy is, and tottering as it seems to be, that power, or its subordinates, could never persecute more. "And all that dwell on the earth shall worship the beast, whose names are not written in the book of life of the Lamb slain from the foundation of the world." It is impossible to get quit of this by saying, "This refers to the Dark Ages; this was fulfilled before Luther." I ask, had the men who dwelt on the earth set up the Image of the beast before Luther's days? Plainly not. The decree of the Immaculate Conception was the deed of yesterday. The prophecy, then, refers to our own times--to the period on which the Church is now entering. In other words, the slaying of the witnesses, the grand trial of the saints, IS STILL TO COME. Is it past, or is it still to come? This is a vital question. The favorite doctrine at this moment is, that it is past centuries ago, and that no such dark night of suffering to the saints of God can ever come again, as happened just before the era of the Reformation. This is the cardinal principle of a work that has just appeared, under the title of The Great Exodus, which implies, that however much the truth may be assailed, however much the saints of God may be threatened, however their fears may be aroused, they have no real reason to fear, for that the Red Sea will divide, the tribes of the Lord will pass through dry shod, and all their enemies, like Pharaoh and his host, shall sink in overwhelming ruin. If the doctrine maintained by many of the soberest interpreters of Scripture for a century past, including such names as Brown of Haddington, Thomas Scott, and others, be well founded - viz., that the putting down of the testimony of the witnesses is till to come, this theory must not only be a delusion, but a delusion of most fatal tendency--a delusion that by throwing professors off their guard, and giving them an excuse for taking their ease, rather than standing in the high places of the field, and bearing bold and unflinching testimony for Christ, directly paves the way for that very extinction of the testimony which is predicted. I enter not into any historical disquisition as to the question, whether, as a matter of fact, it was true that the witnesses were slain before Luther appeared. Those who wish to see an historical argument on the subject may see it in the Red Republic, which I venture to think has not yet been answered. * The author does not himself make the humiliation of the Babylonian king a type of the humiliation of the Church. How then can he establish any typical relation between the "seven times" in the one case, and the "seven times" in the other? He seems to think it quite enough to establish that relation, if he can find one point of resemblance between Nebuchadnezzar, the humbled despot, and the "world-power" that oppresses the Church during the two periods of "seven times" respectively. That one point is the "madness" of the one and the other. It might be asked, Was, then, the "world-power" in its right mind before "the seven times" began? But waiving that, here is the vital objection to this view: The madness in the case of Nebuchadnezzar was simply an affliction; in the other it was sin. "that as the Church is to be tyrannized over by the idolatrous power throughout the whole of the seven times, she will be oppressed during the first half of the 'seven times,' by idolatry in the form of Paganism, and during the last half by idolatry in the form of Popery." Now, the first half, or 1260 years, during which the Church was to be oppressed by Pagan idolatry, ran out exactly, it is said, in A.D. 530 or 532; when suddenly Justinian changed the scene, and brought the new oppressor on the stage. But I ask where was the "world-power" to be found up to 530, maintaining "idolatry in the form of Paganism"? "I beheld, and the same horn made war with the saints, and prevailed against them; until the Ancient of days came, and judgment was given to the saints of the Most High; and the time came that the saints possessed the kingdom." This language implies that the judgment on the little horn, and the putting of the saints in possession "of the kingdom" are contemporaneous events. Long has the rule of the kingdoms of this world been in the hands of worldly men, that knew not God nor obeyed Him; but now, when He to whom the kingdom belongs comes to inflict judgment on His enemies, He comes also to transfer the rule of the kingdoms of this world from the hands of those who have abused it, into the hand of those that fear God and govern their public conduct by His revealed will. This is evidently the meaning of the Divine statement. Now, on the supposition that 1792 was the predicted period of the coming of the Ancient of days, it follows that, ever since, the principles of God's Word must have been leavening the governments of Europe more and more, and good and holy men, of the spirit of Daniel and Nehemiah, must have been advanced to the high places of power. But has it been so in point of fact? Is there one nation in all Europe that acts on Scriptural principles at this day? Does Britain itself do so? Why, it is notorious that it was just three years after the reign of righteousness, according to this theory, must have commenced that that unprincipled policy began that has left hardly a shred of appearance of respect for the honor of the "Prince of the Kings of the earth" in the public rule of this nation. It was in 1795 that Pitt, and the British Parliament, passed the Act for the erecting of the Roman Catholic College of Maynooth, which formed the beginning of a course that, year by year, has lifted the Man of Sin into a position of power in this land, that threatens, if Divine mercy do not miraculously interfere, to bring us speedily back again under complete thraldom to Antichrist. Yet, according to the theory of The Great Exodus, the very opposite of this ought to have been the case. But to this only I call the reader's attention, that even on the theory of Dr. Wylie himself, the witnesses of Christ could not possibly have finished their testimony before the Decree of the Immaculate Conception came forth. The theory of Dr. Wylie, and those who take the same general view as he, is, that the "finishing of the testimony," means "completing the elements" of the testimony, bearing a full and complete testimony against the errors of Rome. Dr. Wylie himself admits that "the dogma of the 'Immaculate Conception' [which was given forth only during the last few years] declares Mary truly 'divine,' and places her upon the altars of Rome as practically the sole and supreme object of worship" (The Great Exodus). This was NEVER done before, and therefore the errors and blasphemies of Rome were not complete until that decree had gone forth, if even then. Now, if the corruption and blasphemy of Rome were "incomplete" up to our own day, and if they have risen to a height which was never witnessed before, as all men instinctively felt and declared, when that decree was issued, how could the testimony of the witnesses be "complete" before Luther's day! It is nothing to say that the principle and the germ of this decree were in operation long before. The same thing may be said of all the leading errors of Rome long before Luther's day. They were all in essence and substance very broadly developed, from near the time when Gregory the Great commanded the image of the Virgin to be carried forth in the processions that supplicated the Most High to remove the pestilence from Rome, when it was committing such havoc among its citizens. But that does in no wise prove that they were "complete," or that the witnesses of Christ could then "finish their testimony" by bearing a full and "complete testimony" against the errors and corruptions of the Papacy. I submit this view of the matter to every intelligent reader for his prayerful consideration. If we have not "understanding of the times," it is vain to expect that we "shall know what Israel ought to do." If we are saying "Peace and safety," when trouble is at hand, or underrating the nature of that trouble, we cannot be prepared for the grand struggle when that struggle shall come.